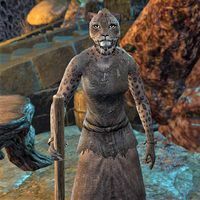 Airdeoza is a Khajiit slave at Tel Aruhn. "Airdeoza is not one to try to rise above her station. No, no, let her be safe among the unseen, the forgotten. That is where it's safe." "Ah, yes, Magister Gothren's favorite kind of visitors. He's always asking when the next outlander will brighten his doorstep. I'm sure seeing you will put him in such a kind mood." "Perhaps some masters are kind, are bearable. This one has heard such tales. Magister Gothren is not such a master." This page was last modified on 7 February 2019, at 18:13.